Preferred Climate: Temperate; found in woodlands and moist meadows. This clump-forming perennial has deeply toothed basal leaves and grows up to 100 cm high with a 60 cm spread. 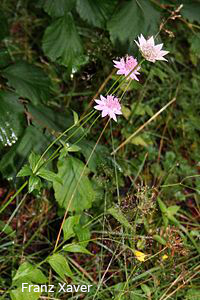 The umbrella-shaped blooms are a unique color of soft pink, about 2-3 cm across. The bracts have a papery feel to the touch and are green on the outside, pink to white inside. A profuse bloomer, and a popular addition to floral arrangements. For maximum freshness, please keep seed refrigerated in its original packaging until it is time to plant. Sow seed in containers as soon as available; seeds germinate best with a 2-3 month cold stratification period. row in moist, fertile, humusy soil in sun or partial shade.